The Wizard of Oz Teapots…. Beautiful! There are some movies (especially from the Golden Age of Hollywood) that I will watch each and every time they’re on..
And one of my favorite things of all time… The Wizard of Oz. Is it me or does this movie just get more wonderful every single time you see it? I think that the further-removed we get from movies like this, the more special they are to us because of what they represent – a simpler time and a simpler/less-complicated life… and world! I guess that’s why so many of us LOVE to surround ourselves with memorabilia – so even when we aren’t actually watching the movie, with it’s larger than life characters, we can still enjoy the movie, with it’s larger than life characters. The gorgeous Cardew Design Wizard of Oz Teapot (pictured at the top) is a breathtakingly beautiful tribute to this wonderful and legendary romp. See Cardew Design Wizard of Oz Teapot to take a closer look. Another equally-beautiful Wizard of Oz Teapot is pictured below. This adorable hand-painted ceramic Wizard of Oz Teapot also features four of the lovable characters on the front. I have a confession to make – I have never seen a single episode of the insanely popular Doctor Who. As far as I’m concerned, I have no idea WHO Doctor WHO is! And yet… I am so in love with this adorable Doctor Who Tardis Teapot , I’m beside myself. 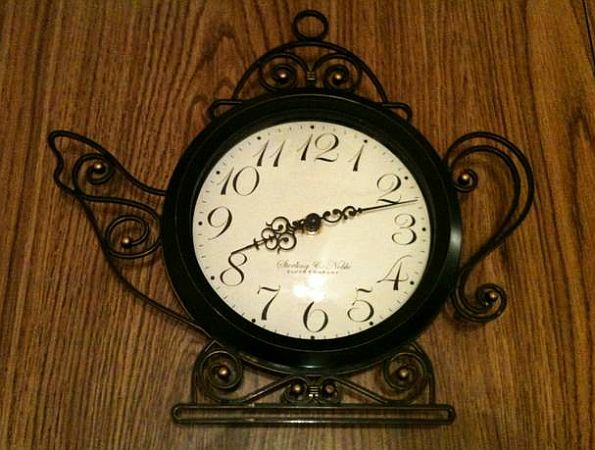 This beautiful collector’s item is fashioned after the time machine in the BBC TV show Doctor Who. Wait? Time machine? What have I been missing?!?! See Doctor Who Tardis Teapot for more information while I go look into catching up on Netflix! The handsome Denby Dinnerware, Jet Stripes Teapot shown here is available online from one of my all-time favorite retailers – Macy’s. Macy’s – so you know the quality is as good as it gets while the price keeps everything within reach. Why can’t more retailers accomplish what Macy’s seems to do effortlessly? Perfect for every day use, this stoneware is versatile and stylish. A colorful striated pattern lends your tabletop modern polish. From Denby’s dinnerware and dishes collection. Holds 2 1/4 pints. Click the link or the picture of the pitcher (say that 3 times fast) for more information. 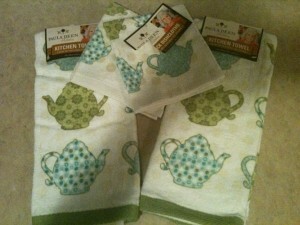 Adorable Christmas gift for this tea lover! The teapot clock in the picture above is a Better Homes & Gardens piece, and it was a gift to me from my awesome mom (a contributor on this site as well). It’s hanging on my dining room wall now along with a few other coffee-and-tea pieces of art, and I loveeeeee ittttt. Thanks, Madre! You need to know that I’m very happily in love with these kitchen towels. The Ladybug With Swirls Teapot , shown here, is too cute for it’s own good. As my family will tell you, I’m a sucker for all animals, birds, and EVEN bugs. I’ve never met a ladybug I didn’t love and I’m not convinced it’s even possible for me to look at one without smiling or getting down to its level to say hello. If you’re as wild about ladybugs as I am, the teapot above has your name all over it. But, much to my pocketbook’s chagrin, there’s more. Check out the other ladybug tea-related goodies in the “slideshow” below. Click on each for more information. As you can imagine, I want them all! Sigh, my poor husband.